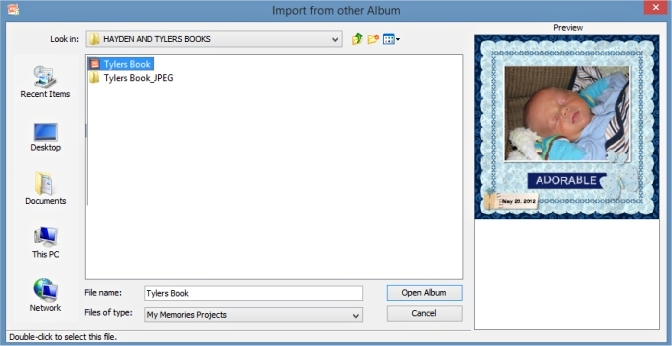 MyMemories Blog: Importing Pages From Other Photo Book Albums by LLL Creations! Importing Pages From Other Photo Book Albums by LLL Creations! If you are anything like me you have what seems like a million albums on the go at any given time. I have photo books on the go for each grandson and a book for gardening and nature, a book for miscellaneous photos etc. I have a folder full of books I keep adding pages too. Sometimes I will create a page and then I think 'Darn, I wish I would of put this page into that 'other' book! When this happens, you don't have to redo that page in the other book, just import it into the other book. I'll show you how ... it's easy! Open up the book in My Memories Suite where you want the page to go. Now a screen will pop up that will show you all of the pages that are in that album. You can click on each page and it will show a preview of that page on the right side. 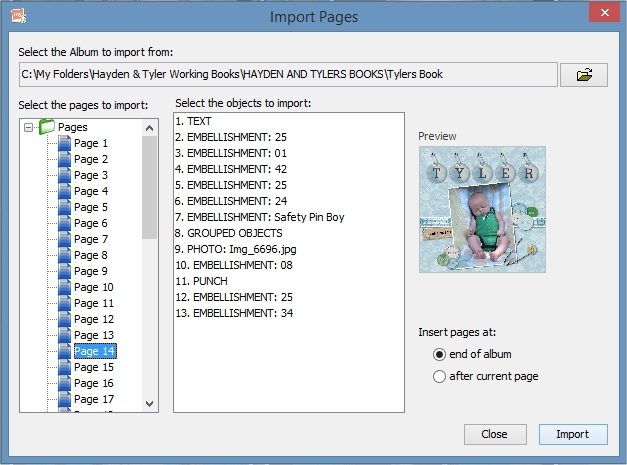 When you find the page you want to import just click the 'Import Button'. You can choose if you want it to go at the end of your album or after the current page you have selected. But it can be moved after you import it anyways so it's not that important. You now have a copy of that page in the book you have open. NOTE: It does not move the page, it's copies it. So the page will still be in the original album it was made in. You can always delete it from that album if you don't want it there anymore. So there you go. Moving pages from one album to another is easy and every once in a while it really comes in handy. You are a total lifesaver! Thank you so much! I put 10 pages in the wrong year album and have been trying to figure out how to fix the mess up for a couple hours.